The Eisteddfod is just as exciting but in a different way. I didn't recognise Rod Richard's description of a "sad, introspective event" but I could relate to his anecdotes of people wandering endlessly around the field in search of long lost friends. I stumbled across quite a few of these myself, even though I am not a Welsh speaker nor a part of a Welsh speaking community. I also witnessed others, including AMs, who seemed to have decamped to Meifod for the week and must have been on their 100th circuit already. Highlights of the day were Rhodri Morgan cooking with alcohol and the presentation by HTV in an airless greenhouse-like building in which after half an hour of clips the presenter reappeared bathed in sweat. His previously pristine pink shirt was literally wringing wet and clinging to his skin. He looked like he had been for a swim in it whilst we were watching his handiwork. Emlyn Hooson stood up to congratulate him and brought the house down with the remark that the presenter was wearing the same shirt that day as he had when he had interviewed him some years ago. 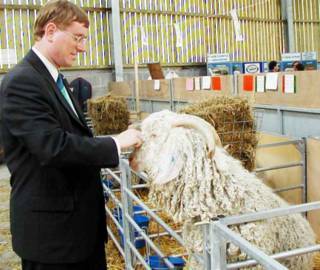 The Royal Welsh show is always exciting despite the traffic jams. I don't normally do animals but I was told by my spin doctors that I needed photographs to illustrate the party's policies on literature for farmers. As you can see from the photograph above I don't think that they will be very convincing. My approach to this Angora goat was more that of a lifelong cat owner than of somebody who might be comfortable on a farm. Still I got to sample lots of Welsh food (with the exception of the rubbery chicken burger) and managed to avoid being put onto the fair ground rides for more photographs.